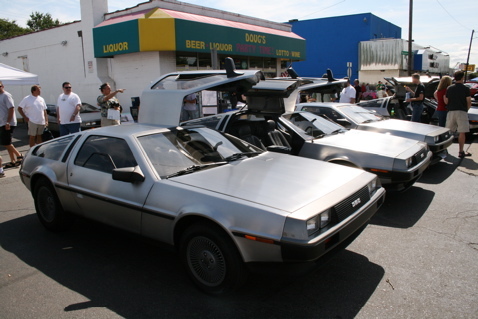 Let's Do The Time Warp Again: The DeLorean Will Be Back In 2008! "Job one will begin the third quarter of this year, with delivery by Q1 of 2008. We're aiming for $57,500 as the sale price." And yes, we're also told it will look like a DeLorean — square nose, gull-wings and all. This time, instead of attempting to mass produce the cars, the DeLorean folks will be building them by hand at their assembly plant in the li'l town of Humble, Texas. No word yet on issues regarding EPA testing or production numbers (we didn't think to ask), but the Detroit News is claiming it'll be one or two a month. The shots below were from the Saturday meet-up during the Woodward Dream Cruise where we spoke with Espey.